6" Heel W/ Rhinestones On Platform. 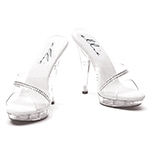 5" Clear Sandal with rhinestones. 5" Heel Clear Rhinestone Sandal.